Each week the PC Gamer team puts some irons in the fire and hammers out a batch of the hottest takes. 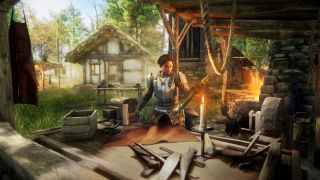 I don't quite categorise this as a high or low, but it is interesting: Amazon is making a big sandbox MMO where hundreds of players are fighting over a continent. It was one of the truly big, unusual things I saw at Gamescom last week, and this week I wrote about it. If you're wondering what piques Amazon's interest about making an MMO, I think it's because the game uses their AWS cloud technology to support this many players at once. The demo was a little too slight to get a grip on how the larger scale elements will play out, but it has promise when it comes to generating stories. If you're looking for a big, new MMO, it'll at least be interesting to see how Amazon's effort to move into that space will pan out next year. We were too busy travelling back from Gamescom to talk about Gamescom last week, so let’s recap some of the really tasty stuff. There was Cyberpunk, of course, which we’ve picked over in detail during behind-closed-door sessions and the release of the full gameplay slice this week. There were some cool, smaller games there too. Mount and Blade 2: Bannerlord is shaping up nicely, though in this demo it played like a prettier version of Mount and Blade: Warband—most of the advanced features require a lot of progress and empire-building to achieve. Going smaller still, I had an absolute blast with My Friend Pedro, which is a simple game about a guy and his banana friend who just wants to murder every goon in the world in slow motion. Looking ahead to next week, I’m preparing to return for my six-monthly dose of Destiny 2 as the massive Forsaken expansion lands on PC. That will probably put my Warframe habit on hold, for a little while at least, though I have just unlocked a warframe with a top hat and a pop collar who can phase in and out of reality—I love that game’s weird sense of style. The Divinity: Original Sin 2 Definitive Edition is out as a free update on PC, and I am ready to start the whole thing over. The release is mostly just a good excuse to dedicate another 80 hours to turn-based wizarding, but the 50-plus pages of patch notes don’t hurt as motivation—the UI updates especially. Silent Hill 2 is one of my favourite games, lingering somewhere in my personal top 5, but the PC release has always been a major disappointment. While you can run it at higher resolutions than the PS2 version, it actually looks and sounds worse in some respects—particularly the flat, lifeless fog, which has none of the original's swirly, eerie motion. But now, thanks to the tireless efforts of a whole team of talented modders, you can knock the PC edition into shape, making it the best way to play one of the greatest horror games ever made. This unofficial Enhanced Edition fixes audio bugs, adds proper controller support, subtly changes the look of the game to better match the PS2 version, and restores that fog to its former glory. There are other features too, all of which are detailed here. The installation process is finicky, but it's worth it. I'm replaying the game now in 4K and I'm amazed by how well it holds up. If you've never played Silent Hill 2 before, now's the time. Konami’s official 2012 HD release on consoles was famously a disaster, so I’m glad we now have an alternative. I am not a hardware writer—though we are looking to hire one, by the way—but this is good news for everyone: GPU sales are getting back to normal because the cryptomining gold rush is ending. I wasn’t planning to upgrade from my 980 until we learned all about the RTX 2080, which hopefully means the 1080 will drop in price. Sure, I’d love to trace some rays with a 2080, who wouldn’t? But I’m okay with being a generation behind, too, if the price is right. Well hey, it's that time again: The PC Gamer Top 100! It's our annual list of 100 games we recommend to people right now, pieced together from hundreds of suggestions from the PC Gamer team and hours of conversation about what belongs on the list. We did things a bit differently in our nominations process this year, and I think it resulted in an interested, varied selection of games, many of which have never been on the list before. Special shout out to Pip for bringing many, many smart suggestions to the table and explaining passionately why they deserve to be there. Also, yes, you have me to thank for Drawful 2 being on the list. Play it at your next party. I promise you it'll be a bigger hit than Deus Ex.